The raven is one of the most predominant birds in Grand Canyon, from their soaring aerial acrobatics, to their clever raiding of backpacks for food. Many people mistake them for crows, which are actually quite rare in the canyon. Ravens are much larger than their other corvid cousins, with a heavy, slightly curved beak and wedge-shaped tail. They mate for life, but will find another mate if one dies. Mated pairs will rub beaks (the first “Eskimo kiss”? ), preen each other and make sweet noises that help cement the bond between them. They build large nests made of sticks and lined with soft materials- bark, fur, hair, or even plastic bags. The nests are usually found on ledges or protected cliff alcoves, and contain 3 to 7 beautiful turquoise-green eggs with brown mottling. The female is dependent on the male to provide food for her while she sits on the eggs, which take about three weeks to hatch. Young birds fledge (learn to fly) in about six weeks, and will hang around the parents loudly begging for food and generally causing mischief as they learn about the world. Juveniles are as big as the adults, but have yellow coloration at the edges of their mouths that turn black with maturity. They leave mom and dad in the fall, and frequently form large flocks where they establish social order and start the process of pair bonding, much like groups of teenagers at the local mall! Occasionally a pair will have one of their offspring stay with them another year and act as a “babysitter” for the next year’s youngsters. Ravens are definitely the brains of the bird world, and also appear to possess a great sense of humor. They frequently will gang up on other animals such as eagles, conspiring together to rob them of food. One will pull at the eagle’s tail while the other flies off with the prize. They have been known to guard their nests by dropping stones on predators, including well-meaning human researchers, who will also swear that ravens can aim their feces in an all-out aerial attack. They love to play climbing and hanging games, will make snowballs and roll them around, or repeatedly slide down icy hills on their rear-ends only to walk back up and do it again. They can imitate a variety of natural and man-made noises including frogs, dogs, voices, and ice-cream trucks. Researchers have demonstrated their ability to count objects up to the number six, and they will use and even alter tools to obtain food. Many a canyon boater or backpacker has discovered their ability to unzip zippers, and pairs have definite territories they patrol as they wait for an unguarded food source. They have a variety of different vocalizations, the meaning of which actually varies form area to area. 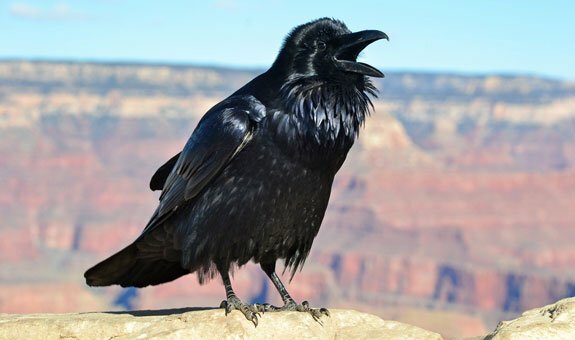 Grand Canyon ravens speak a different dialect than Yellowstone ravens! Ravens have always figured prominently in mythology and legends. Independent thinkers, they disobeyed Noah when they failed to return after being sent out in search of dry land. They have been associated with gods such as Apollo, Shiva, and Kali, and with the Norse god Odin. “Hugin” and “Munin” (“thought” and “memory”), would fly around the world and then sit on Odin’s shoulder, reporting back all they had seen and heard. Traditionally associated with death and darkness in the Old World, the opposite is true in the west, where they figure prominently in creation myths, especially those of native peoples of the Pacific Northwest. Both the Hopi and Navajo respect the raven and crow, and tradition tells that Crow Mother is the Mother of all Kachinas. The ravens doing barrel rolls over the abyss of the canyon represent the epitome of intelligence, loyalty, and mischief, and seem to be a celebration of life itself. Guard your M&Ms carefully—there’s bound to be a raven watching! Audubon’s Raven Page – Another great page for identification, photos and sounds. I especially love the popping calls! Ravens do have such a range of calls.